The escalate keyword is pretty much the new iteration on kicker, and just as useful. There's not much to complain about when a spell remains useful and even becomes more useful the longer a game goes on, especially for fast decks that sometimes get overwhelmed by late-game spells. It happens that Blessed Alliance's modes have obvious defensive applications, but there are certainly plenty of times when it'll be worth three or more cards in a creature race too. My advice? Blessed Alliance is good when you're in a race situation, and you play it during your opponent's combat. Remember that, and it'll go smoothly. Also remember, if you're only paying for one mode, don't make it the 4 life. Usually you'll want the sacrifice mode, UNLESS you can by untapping two of your creatures take out something better than his worst attacker. Ask yourself which attacker you'd sacrifice if you were him, and if you have a tapped creature that can block better without dying (if it dies, you just gave him a 2-for-1) then you want the untap option. If you have four mana, by all means go for both. At this point you might actually take the 4 life, if the untaps don't offer you any good blocks (or even an extra use of a strong tap ability). Flexibility is a good thing for any card to have, which is why modal spells like charms and commands have been format staples for many years. 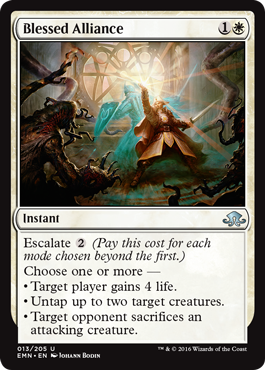 While the new escalate mechanic looks fancy, it’s effectively a reworked entwine (from the original Mirrodin block, most famous on Tooth and Nail). Individual modes of a card tend to be underwhelming on their own, but you pay for it with the flexibility of the card itself.